Reports are the core part of test link. Test Link gives us lots of option to create a report as per our need. We can create different reports for a test project. You need to navigate on ‘Reports’ screen and there you will get options to generate reports like Test Plan Report, Test Report, Test Report on build, General Test Plan matrix, Results by Tester per build, Test case Assignment overview, Test result Matrix, Test Result Flats, Failed Test cases, Blocked Test cases, Not Run Test cases, Test cases without Tester Assignment, Charts, Bugs per Test cases etc. Now we will learn how we can create it. First of all you need to log in with Test link then Select a Test Project. Afterwards click on ‘Report’ button from home page as per image. As far we know what the reports are itself. Report will give you the accurate result of your requirement. We have already discussed different type of reports which can be generated in Test Link. Now we will see the examples for same. Here in Image you can see the different types of reports are displayed. You will navigate on this screen after click on ‘Report’ button of home page. You need to click on Reports name as per your requirement and then fill up criteria for the reports and click on Generate button so you will get your result. First report is ‘Test Plan Report’. Test Plan report will display all the information about the test plan of a test project. For example if a Test Suit ‘Login & Authentication’ is assigned in Test Plan of a selected Test Project then all the test cases which is fallen in this suit will be displayed on ‘Test Plan Report’. As we have seen in the image that ‘Test Suit’ name will be displayed and created test case information is presented with summary and priority. Second report is ‘Test Report’. In this report you will find out the execution result of a test case for a test suit. It will display the information about test case as it is passed or failed. You can verify the image that here Test suit name, Test case information and execution result is displayed. Test case was passed successfully so here execution result is displayed as ‘Passed’. Next is ‘General Test Plan Matrix Report’. 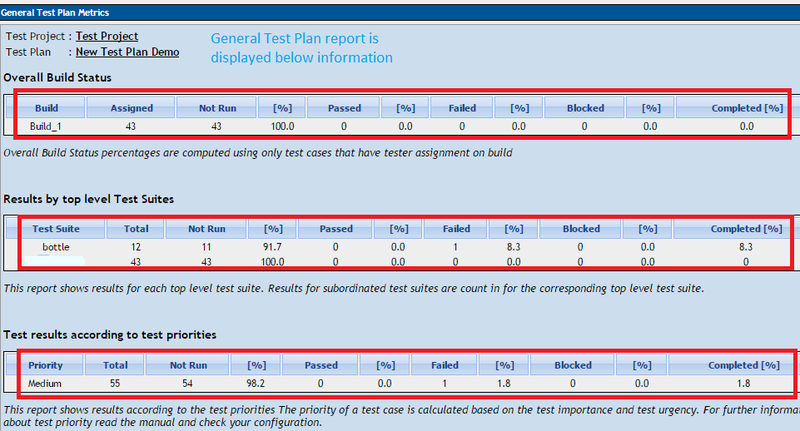 This report will display total percentage of passed, failed and blocked test cases with its priority. You can create this report build wise. As per the image you can verify that it is displaying proper information about a test project. 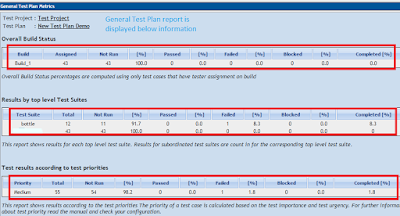 You can compare accurate percentage of Passed, Failed, and Blocked, Not run, Completed test cases of test suits. Build result is also displayed in the report. Another Report is ‘Result by Tester per Build Report’. This report will display all the information about a tester whom is assigned test cases. We can see in the image that, anyone can get idea about assigned work of a tester from this report. Suppose a senior tester have assigned test cases to the tester then he can verify that how many percentage of test cases have been run by the tester from this report. Next is ‘Test Result Matrix Report’. In this report you will find latest execution information of a test case. Test suit name will be displayed on top and then all fallen test cases are displayed over there with execution result as ‘Not Run’,’Failed’ and ‘Passed’. Moving to the next report which will give you the result in excel sheet. Click on ‘Test Result Flat’ option and verify the result. In the image you can see the excel sheet which is display Test Project, Test Plan, Generation Time on top and Test suit , test case, Priority , Build, Assigned to, Result , Tested by , Notes, Execution results under this. Basically it is the perfect report for all project because you can see here, it will display you all the information of test project properly. Next is ‘Test case Assignment Report’. This report will display all information regarding assignment of test cases. Here in image you can verify that user name is displayed on top with assigned test case number. Number of ‘Not Run’, ‘Failed’ and ‘Passed’ test case is also displayed on this report. Next is ‘Chart’. Chart is displayed all the information as graphical view. You can identify easily with this report. It is also displayed information with percentage. Here chart will display you all the information about passed, failed and not run test cases information. Other reports are for Failed Test cases, Passed Test cases, Not Run Test Cases. This all are displayed information for test cases which is passed successfully, Failed or ‘Not run’ till date. This is all about Reports in Test Link. These are the different type of test cases which is displayed different type of information as per your criteria.